Preheat the oven to 240°C /220°C fan assisted/Gas mark 9. Remove the string from the pork, open out flat with the rind downwards on a board, then cut a long pocket about 5cm/2inch down the length of the joint in the thickest part of the meat. To make the stuffing, heat the oil in a small frying pan, add the onion and fry for 5 minutes until softened. Mix with the remaining stuffing ingredients, then spoon into the pocket and the rest on top of the pork. Roll up and retie with fresh string. Put the joint in a roasting tin, rub the fennel and cumin seeds into the cuts in the rind and sprinkle with salt. Add 2 tablespoons of oil to the base of the tin. Roast for 25 minutes. Lower the oven temperature to 180°C/160°C fan assisted/Gas mark 4 for 20 minutes per 450g/1lb or until the meat juices run clear, when the pork is pierced with a knife through the thickest part. 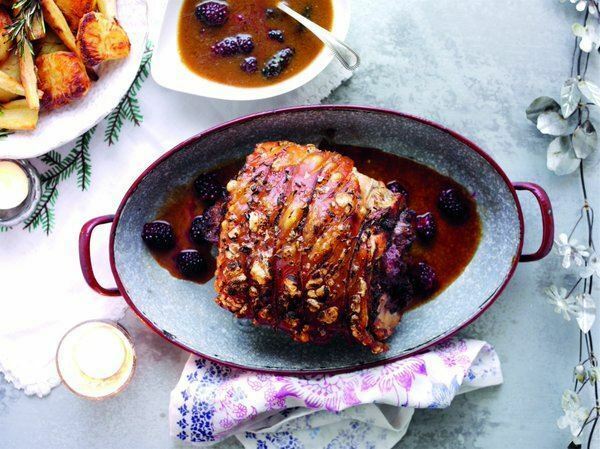 Lift the pork out of the tin, put on to a serving plate and keep warm in a low oven. Drain the excess fat from the roasting tin, then stir in the flour and cook for 1 minute. Pour in the beer and stock, then mix in the sugar and mustard and bring to the boil, scraping up the bits from the bottom of the pan. Boil for 2 minutes, stirring until thickened, strain into a bowl, then pour back into the rinsed roasting tin. Add the blackberries, season with salt and pepper and bring back to the boil to warm the blackberries through. Pour into a serving dish. Remove the string from the pork, then carve into slices and serve with the gravy. To make rosemary roasted potatoes and parsnips, peel 900g/2lb potatoes, cut into chunks then parboil in a pan of boiling water for 10 minutes. Drain and shake in a colander to rough up the edges of the potatoes, then toss with 2 tablespoons of plain flour. Heat 4 tbsp goose fat or sunflower oil in a roasting tin at 180°C/160°C fan assisted/Gas mark 4, below the pork for 5 minutes. Add the potatoes, coat in the fat or oil, and roast for 20 minutes. Add 500g/1lb 2oz parsnips, peeled and cut in half or quarters, depending on size, and 4 sprigs of rosemary, turn in the pan fat or oil then sprinkle with salt and pepper. Roast for 30 minutes until golden. Serve with the roast pork. Many thanks to the girls at www.seasonalberries.co.uk for this recipe.